Thousands of visitors arrive in Halifax by cruise ship every year. Nova Scotia welcomes over 100 cruise ships every summer and all of them dock in the capital city Halifax, which boasts one of the largest harbours in the world. If you’re arriving by cruise ship then you’re in for a treat. Everything is very compact and just a few minutes by foot will get you to the quaint downtown area, including the Historic Properties on the waterfront. It’s also along the water that you’ll find Pier 21, Canada’s equivalent of Ellis Island, now an acclaimed museum, and Titanic history galore at the Maritime Museum of the Atlantic. There’s even one of the famous deck chairs! Walk a little uphill and you can explore Citadel Hill or the trendy shops that line Spring Garden Road or rest your feet by taking a tour like the Harbour Hopper. That’s just scraping the surface of things to do in Halifax, not to mention nearby attractions like Peggy’s Cove and Lunenburg. 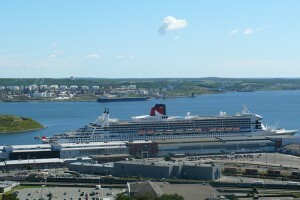 Cruise ships normally dock at one end of the boardwalk along the Halifax waterfront. There’s space for two ships so in most cases you’ll disembark literally in downtown Halifax, next door to Pier 21 and an easy jumping off point for exploring the city. If the first two berths are full when your ship arrives, you’ll have to dock a bit further out of town and be bussed in but this is unlikely. Walking is the best way to explore the attractions along the water. It is a bit of an uphill jaunt to places like Citadel Hill, many museums and the Public Gardens so you may want to grab one of the taxis waiting outside the terminal or take the free FRED bus. It starts at Pier 21 and goes every 20 minutes, from 10:30am to 5:30pm (July through October). It’ll get you to all the main sights with a commentary to boot. Without a doubt, don’t miss Peggy’s Cove. This lighthouse, perched on granite rocks, just might be the most photographed lighthouse in the world but despite all the tourists who flock to see it, the surrounding fishing village remains as timeless and charming as ever. Lunenburg is a further drive but you’ll get to see some of Nova Scotia’s stunning ocean coastline along the way and this UNESCO World Heritage site doesn’t disappoint with its colourful buildings and laidback atmosphere.